This Drawing was made a few weeks ago for a client who no showed on their appointment. It always frustrates me to hold an appointment for a year for nothing especially on what would have been an Amazing and Fun Tattoo to do. Regardless it is always cool to draw a composition like this. 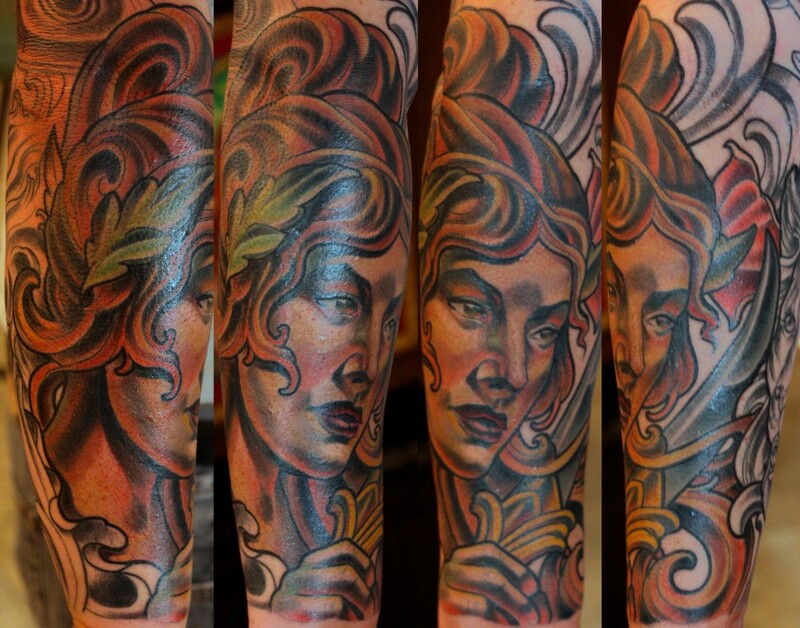 I guess I am writing this blog mostly to address the issue that this is the type of imagery I really enjoy tattooing. Art Nouveau stuff, and when I say that I don’t mean to copy the work of Alphonse Mucha, who is my favorite artist, but I have zero desire in replicating any body’s artwork. So if there are people out that that connect with that type of imagery, timeless classic art I’m always excited to tattoo more of this. Sometimes I can be rather frustrated with the general Tattoo Request here in San Diego. Not to say that I am not constantly being challenged to do projects that resonate well with me, but I often wonder if there is a culture of people here that actually want their Tattoos to reflect Art, vs. a personal record of their life. Don’t get me wrong, I totally understand and can appreciate a person’s desire to have images that are personal in nature, but it would be a different experience to be able to tattoo things that speak to me more on the level of whether the tattoo is visually interesting. I understand people want there Tattoos to have Meaning, but the reality is that’s only Part of what makes a Successful Design. Images that speak to wearer on a visual level to me are as interesting if not more interesting than forcing a concept beyond adding Initials, Dates, Family Names, Words and more Text. I guess what I am trying to say is that I wish people would do more research into their ideas from a visual place, rather than a literal translation of their Body Art. I’ve owned Remington Tattoo in North Park, for over 2 years now. It’s been a great experience and personal journey. I am beyond thankful for the Success, Working With Nathaniel Gann and Sarah Genereux has been real positive influence on me. To watch people grow as Artist, and to have discussions about tattooing as a Fine Art not just a commercial way to crank out product. I hope to continue to make Custom Tattoos that Feed my soul and that help me to grow as an artist. 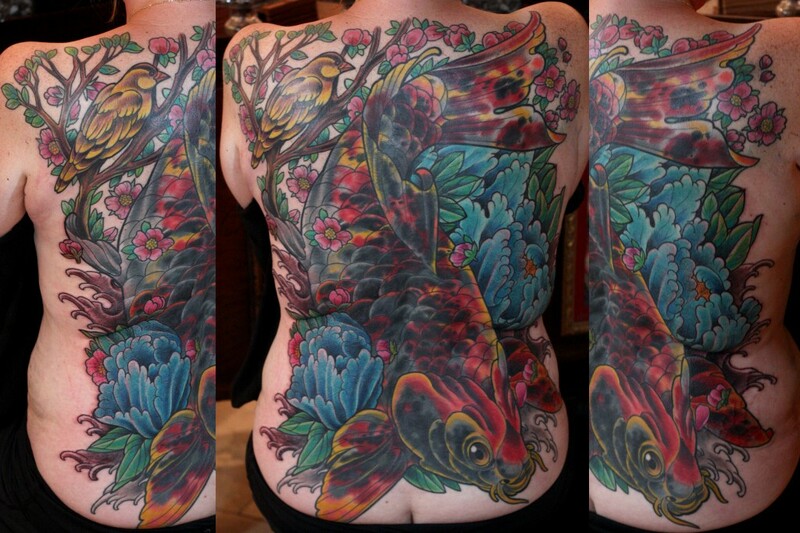 Today I’m posting a fun Custom Tattoo I made on My client Joey. We Have Been putting Custom Tattoos on Him Since 2001. That’s right, I’ve been Tattooing Joey for 12 years. Boy how the time goes! Any how, the Portait is of his Wife. It was done as a Color Portait vs. your Classic Black and Grey Portait Tattoo. 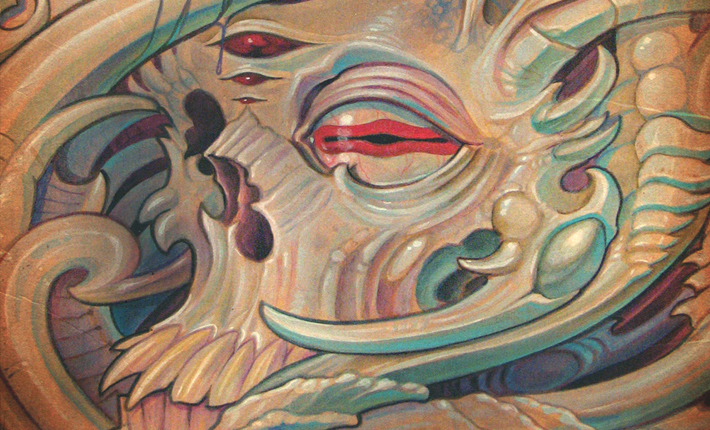 This design is part of a Sleeve that we are Tattooing on him at my Shop Remington Tattoo in North Park. 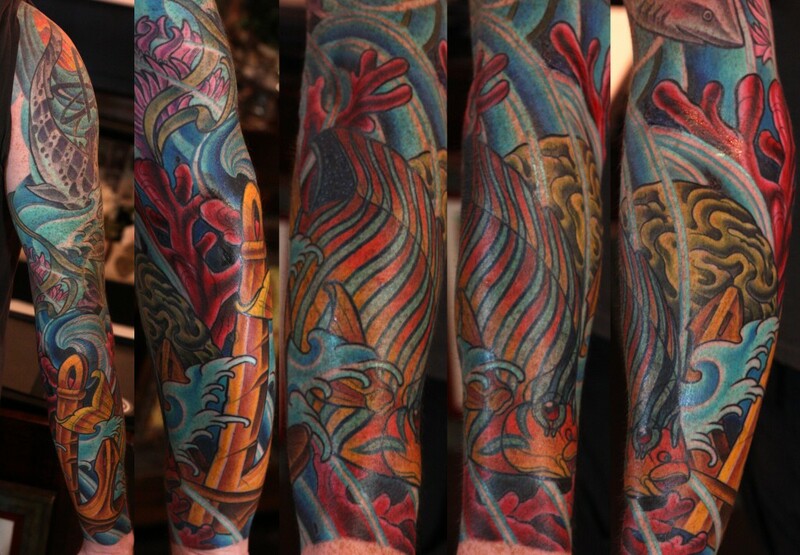 Joey’s Sleeve contains other Awesome elements such as Roses and Falcon that covers the rest of his arm. This Tattoo is also part of Cover Up of some Lettering that he had Tattooed on him a few years before I started to work with him. 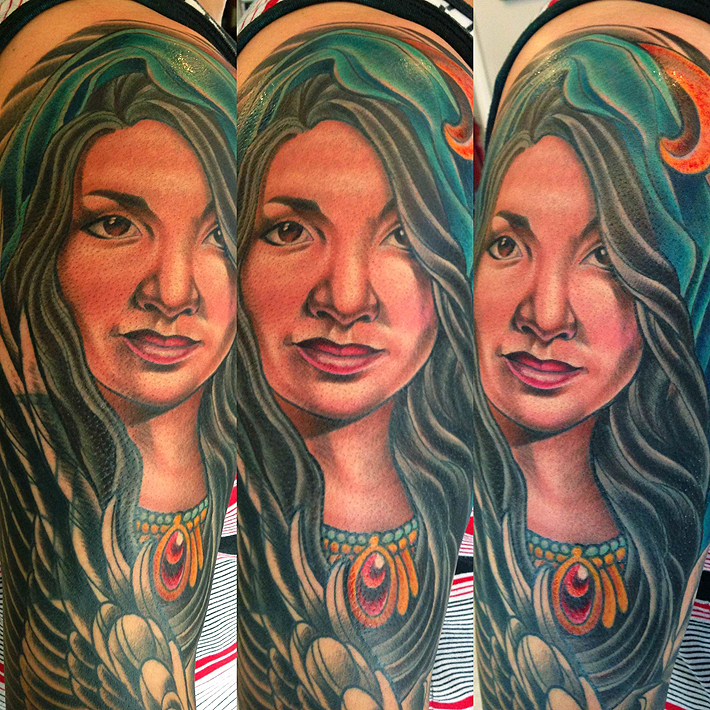 I really Enjoy doing Color Tattoos, but normally I do Portraits in Black and Grey. 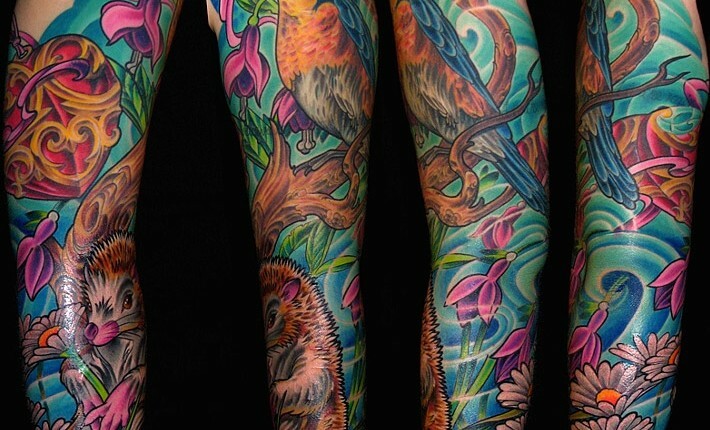 This type of tattoo takes a lot more care and attention than how I would normally work a portrait. Stay tuned for updates as there’s one more Session to complete in out small San Diego Shop. 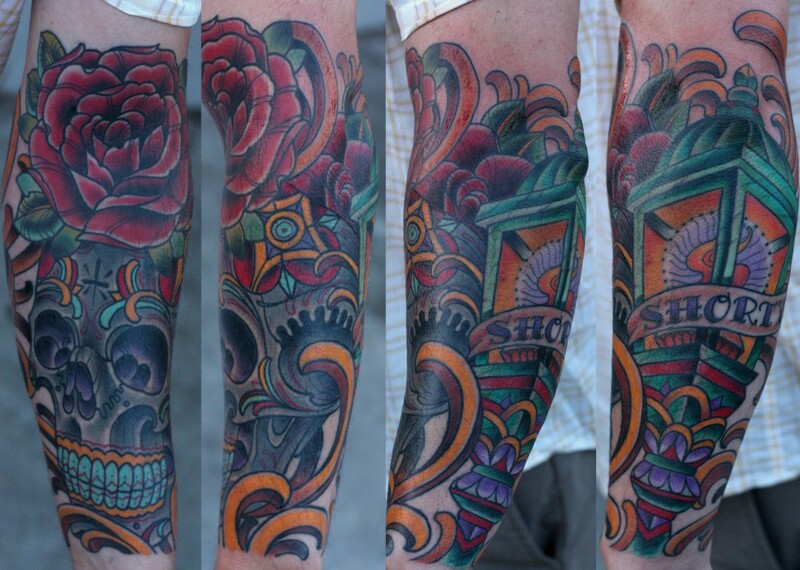 Check out this new Lotus Tattoo by Terry Ribera, one of San Diego’s Best Tattoo Artists. 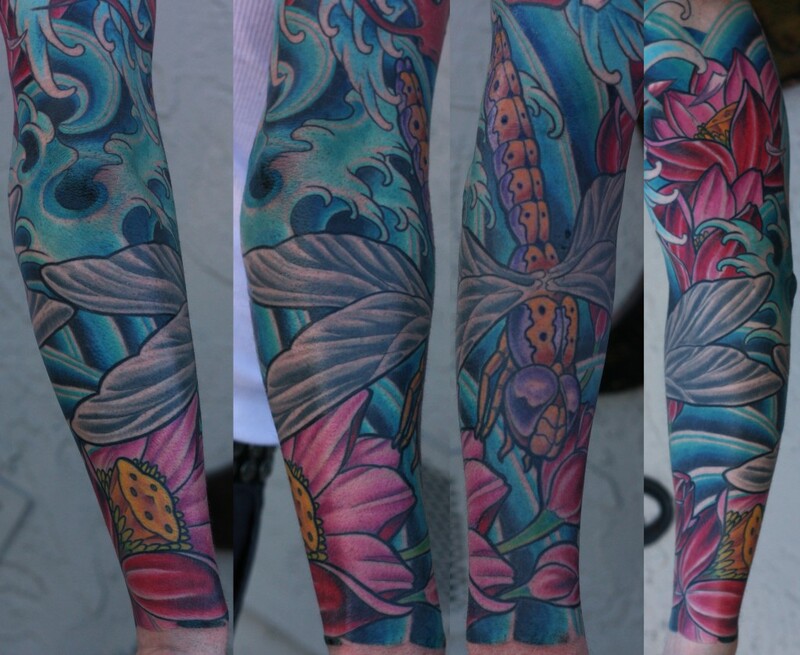 This Tattoo features a Dragonfly with a Lotus backdrop with vibrant colors. 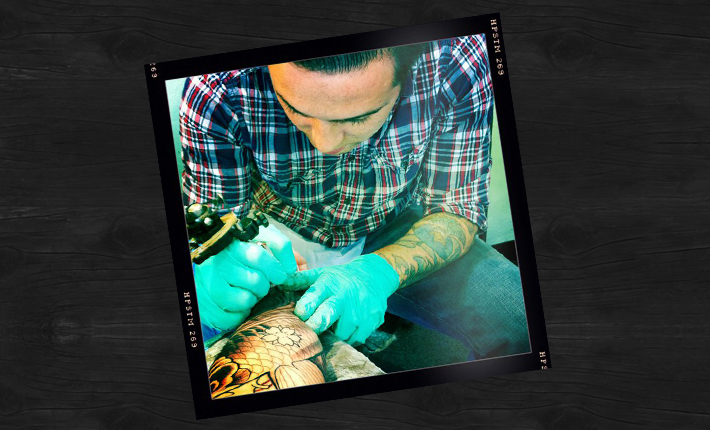 Terry has been a San Diego Tattoo Artist since 2001 and currently is Tattooing in San Diego Tattoo Shop, Remington Tattoo located in Northpark, San Diego, CA.